If you want to lead the rebellion, you need to look the part. Step out from District 13 looking like a futuristic soldier that has every intention of bringing down the Capitol. This Adult Katniss Mockingjay Costume will protect you in a sleek and stylish all black armor. You'll be a symbol of hope and rebellion that neither President Snow or President Coin can ignore. Grab your bow cause you never know when and where you'll need to protect yourself. No one can be trusted now. 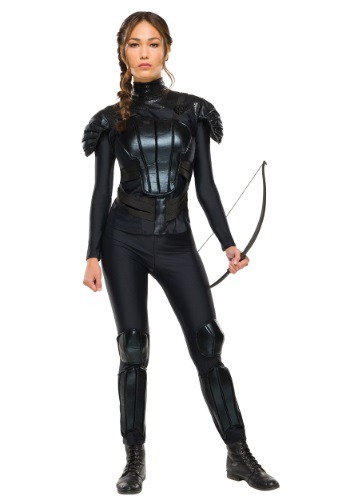 However, you can trust in this costume because it will turn you into Jennifer Lawrence's doppelganger . Let's just hope you don't meet up with President Snow's doppelganger. Great quality for price paid. Fits really well. Love it.